Controversial artist Ai WeiWei is at it again - his latest work, Stacked, is a giant walk-through installation made from 760 piled up Chinese bikes. 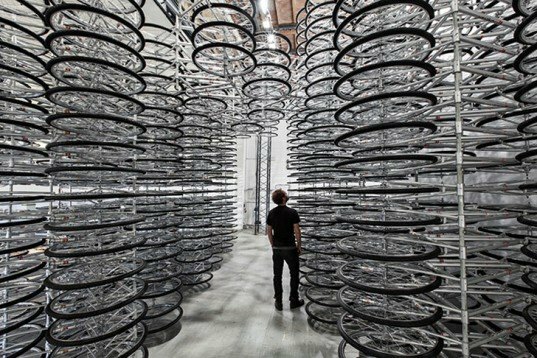 Last year we showed you Ai WeiWei’s magnificent bikes installation "Forever", which was on show in Taipei. Now he is taking the same concept to another level -- and location – and is currently showing his “Stacked” bicycles at Galeria Continua in San Giminano, Italy. On show until the 16th of February, Ai WeiWei’s grand “Stacked” installation was made from 760 bicycles attached to each other. It’s not a coincidence that the artist chose to use “Forever” bikes (made by one of China’s largest manufacturers) for his latest piece. His work is always referencing Chinese culture, political issues and in this case, mass production and the country’s most used transport. But the fact that the bikes are missing parts and attached to each other, immobile, distances them from their intended use as transportation. 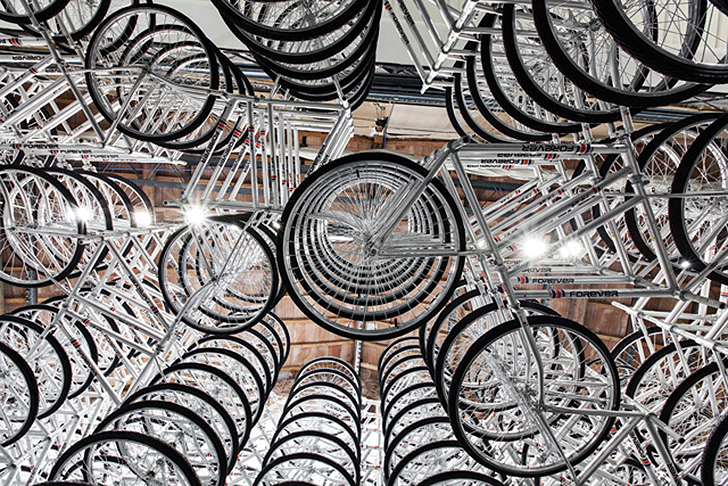 On show until the 16th of February, Ai WeiWei's grand "Stacked" installation was made from 760 bicycles attached to each other. It's not a coincidence that the artist chose to use “Forever” bikes (made by one of China's largest manufacturers) for his latest piece. His work is always referencing Chinese culture, political issues and in this case, mass production and the country's most used transport. But the fact that the bikes are missing parts and attached to each other, immobile, distances them from their intended use as transportation.